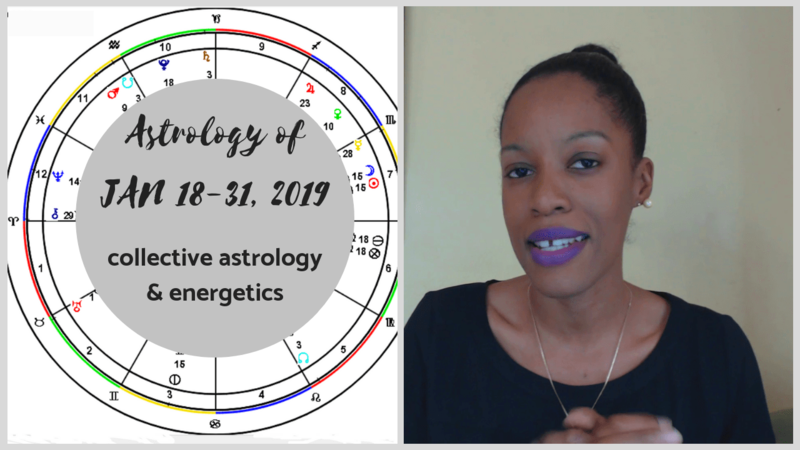 In this video, we look at the astrology of the last stretch of January 2019, from the 18th to the end of the month. We examine the major transits and significant configurations of energy, including sign changes for the Sun and Mercury, the total lunar eclipse happening on January 21, and the month’s final Mars and Venus aspects. You can connect with me over on YouTube by subscribing to my channel. 1) Share this with your network or with a friend if you know of anyone who could benefit from reading this. Use the share buttons below. 2) Get the healing bird’s eye view of your situation from your Higher Mind. We’ll shed light on what your inner guidance has to say on the matter. Book a private reading consultation with me. Returning client? Head here to book a Tools & Support Session. 3) If you’re in Jamaica, click here to book a private consultation with me in my beloved work cottage, The Tea House. Leave feeling more clear, grounded and purposeful. 4) Check out my spiritual awakening mentorship sessions to see if this is the kind of support you need. 5) Connect with me on instagram. (I like hanging out here). 6) Like my blog content? Sign up to my mailing list for exclusive content and updates straight to your inbox. You’ll also get exclusive discounts and goodies. MY 5 TRIED & TRUE TIPS FOR APPROACHING ASTROLOGY & MY CONTENT TO YOUR INBOX.